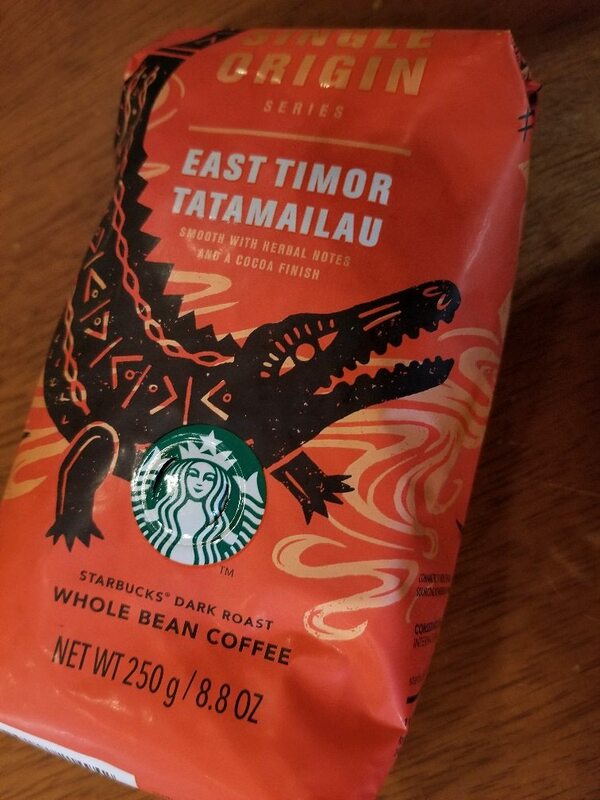 Starbucks is currently offering a new Fair Trade Certified and CAFE practices approved coffee – It is East Timor Tatamailau. 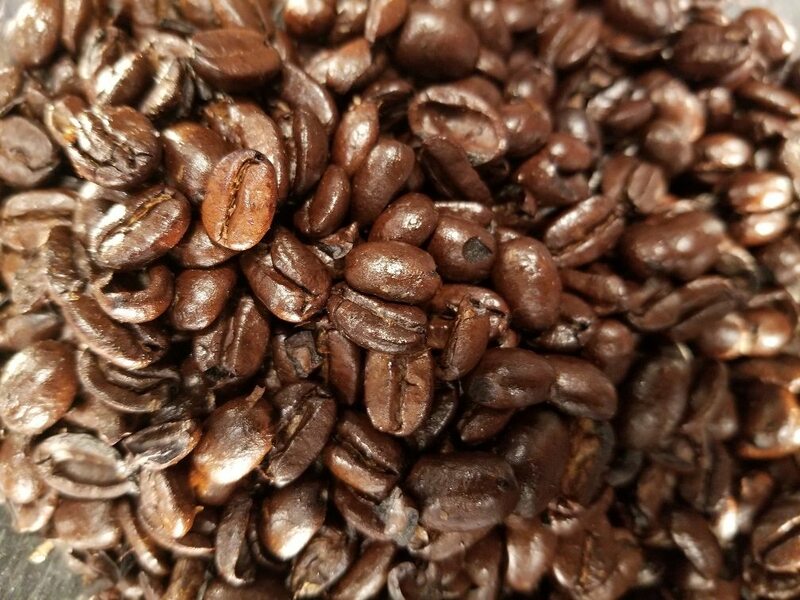 You’ll find it in whole bean format and you might find it brewing as the darker roast coffee of the day. This coffee gets its name from a mountain in the center of the East Timor island – Mt. Tatamailau, the tallest point on the island. In the native language of Tetum, ‘Tatamailau’ means ‘grandfather of all.’ The legend goes that a boy saves a crocodile’s life and in return for his kindness, the crocodile turns into an island. The ridges of the crocodile’s back represent the mountainous island range. The crocodile artwork on the bag was drawn by Victor Melendez, whom you can follow here on Instagram. This coffee is grown at a lower altitude than East Timor Peaberry, but is equally complex as a higher elevation coffee. It’s grown under a canopy of shade trees, producing the same characteristics as a higher elevation coffee. The shade trees slow down the growth of the bean, producing a very dense bean for its elevation. This coffee is grown at roughly an elevation of 1,250 meters, which for East Timor is a lower elevation coffee. If you compare, East Tatamailau to East Timor Peaberry, the peaberry coffee is grown at 1,300 to 1,800 meters. This is a fully washed coffee from the Asia Pacific growing region, which is a little unusual for this area. Many coffees from this growing region are semi washed. The fully-washed processing of this coffee gives it its bright floral, crisp, clean coffee acidity reminiscent of a Latin American coffee. This is a great coffee for an immersion brew technique like a Sowden Softbrew, Clever dripper, or coffee press. It’s a darker roast profile so you’ll detect a little sweetness of the darker roast. I give you a closeup of the beans too. This is a not a Reserve coffee, so you will find it in Starbucks stores that do not have the Clover brewing system. If you want to keep track of Reserve coffees, follow me at DiscoverStarbucksReserve.com. Is Sulawesi returning this year??? Melody, where did you find it in an 8.8oz bag as on the photo? I’ve only seen it in NYC in 1lb bags. @Tomasz – I realize that the packaging I had was an international market bag. The coffee was released to CAP market and the US, and the CAP market got the smaller bag. At the headquarters, a partner handed me a bag as a gift, and I didn’t initially think about the different packaging until your comment. I want to buy East Timor’s coffee but where?